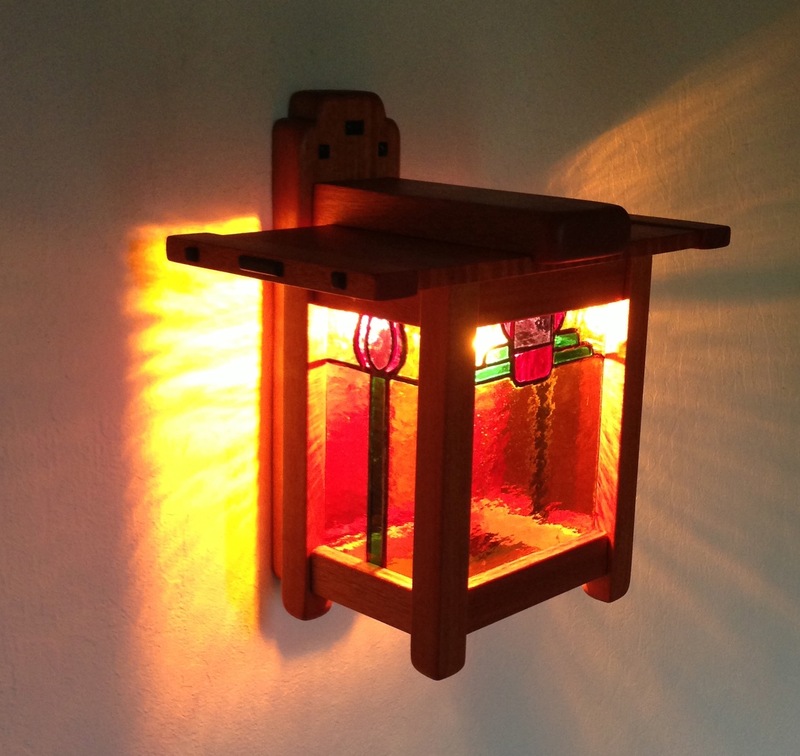 I was Googling for images of the sconces in the inglenook in the Gamble house (which I’m thinking about as a next project) and discovered that Marc Adams is now offering a class in making a reproduction of the Blacker House sconce. His is a more accurate reproduction (wider back panel and pegs in the sconce body). Anyway, without further ado, here are the finished pictures. It actually looks better in person, it was tough to get a good picture. I’d originally planned to use a compact florescent bulb in these (for less heat) but it looked terrible. I’m using a 40 watt refrigerator bulb and that seems to work pretty well. The sconces are done. I finished up the stained glass this morning, and assembled them this afternoon. I don’t have a “finished” picture yet because when I went to install them I realized I needed to patch the wall and touch up the paint…so I’m waiting for the “quick dry” wall compound to dry. The can said “paintable in 30 minutes”, but the fine print also said “allow to dry for 2 to four hours”. So, I guess it’s paintable 30 minutes after it’s been drying for 2 to 4 hours? I remember going to the 1 hour photo place and the guy asked me when I wanted the pictures back. I said “in an hour” and he he looked surprised. Really? Anyway, as soon as the patch drys I’ll get some glamor shots. Apparently, watching joint compound keeps it from drying so I’m sneaking peeks out of the corner of my eye. 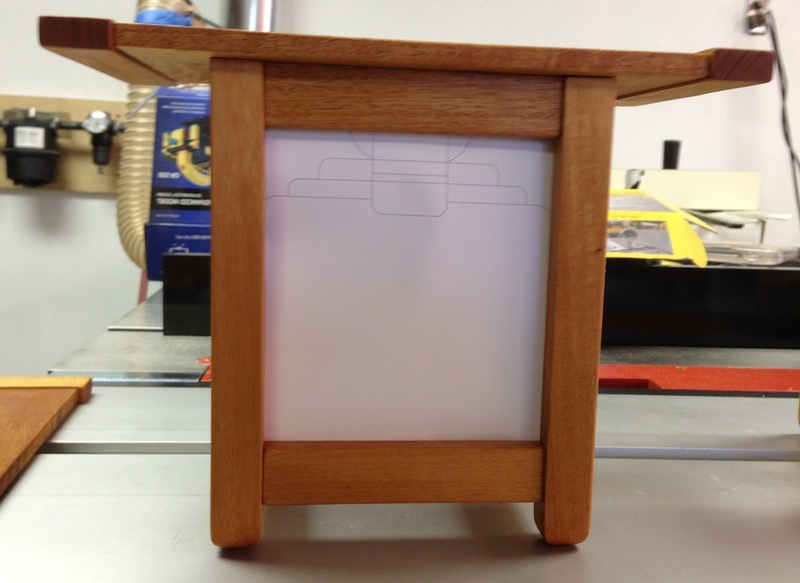 One of the things I was not sure how it would work out was attaching the sconce body to the top and wall bracket. 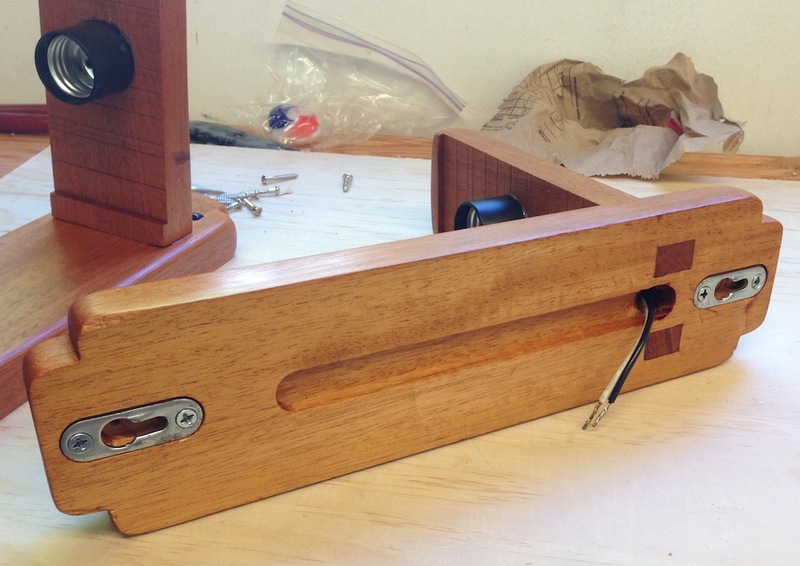 I used some thin 1/2″ aluminum angle extrusion and long wood screws to go through the lid into the support bracket. It seems to be very sturdy. Aluminum brackets installed, keep them just below the surface of the top rail! Long screws installed, it’s rock solid. 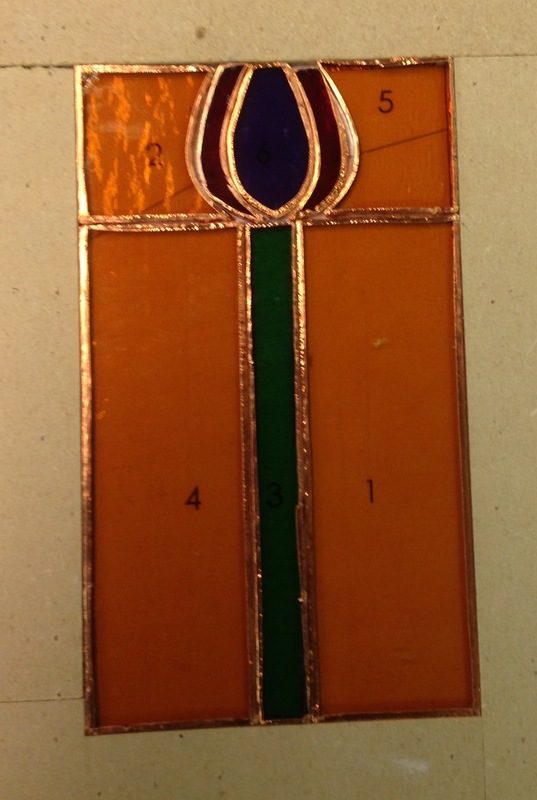 I got a couple of hours in the shop this afternoon, and am very close to finishing the glass for the sconces. All of the parts are cut, ground and fit together. 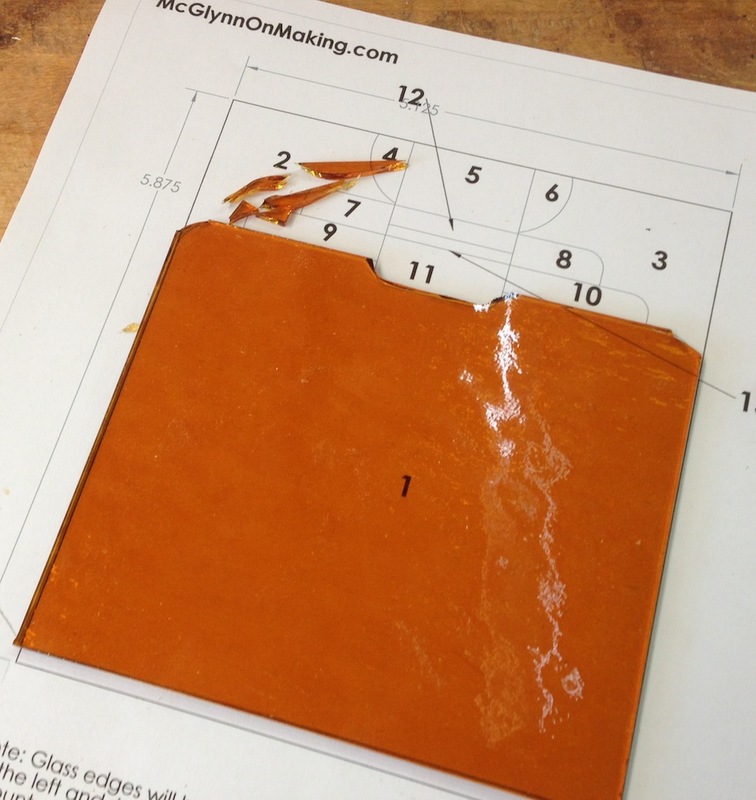 The next step is to add the copper foil to the edges, solder, clean and apply patina. I completely finished the panels for one scones and they are ready to install. I should be able to foil and solder the other panels pretty quickly tomorrow, then I can do the final assembly on theses sconces. 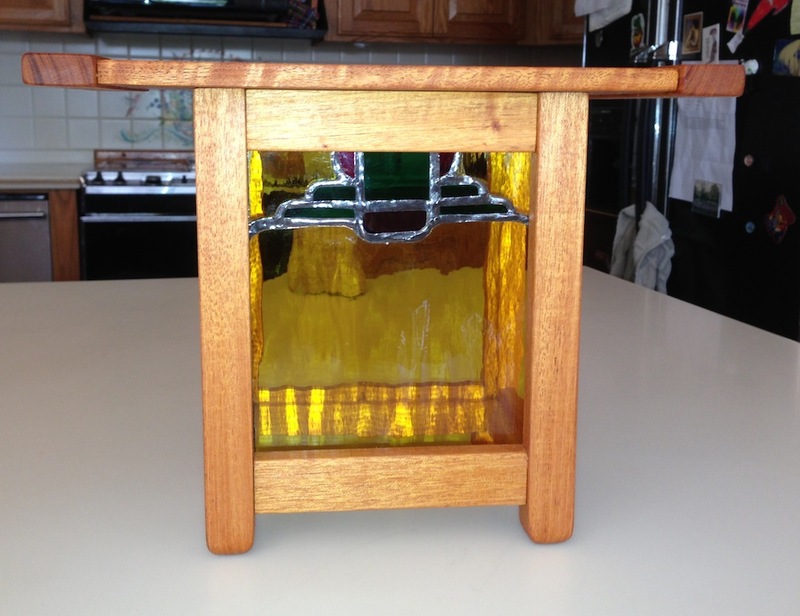 It’s taken a long time to figure out the scale, the joinery and the stained glass, but I’m happy with the results. 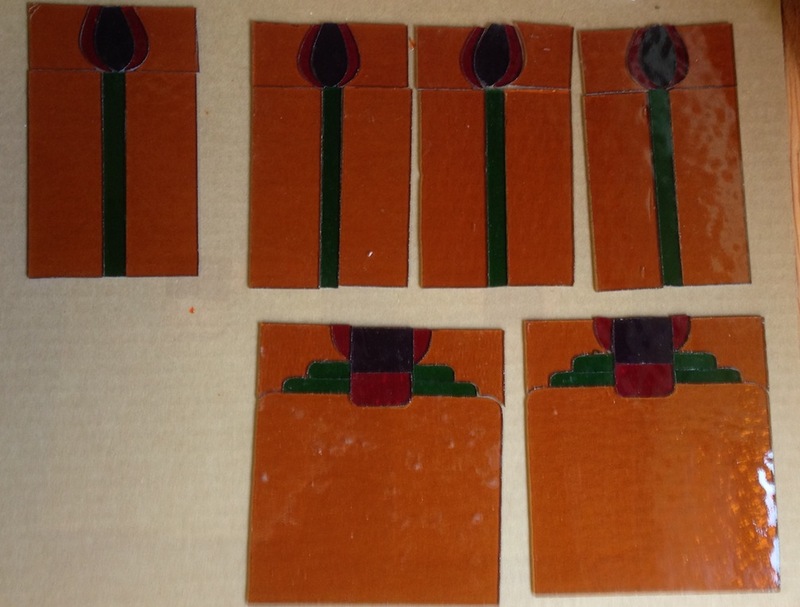 One of the things that was a bit of a struggle was cutting the darker glass colors for the sconces. I couldn’t really see the pattern through the glass. 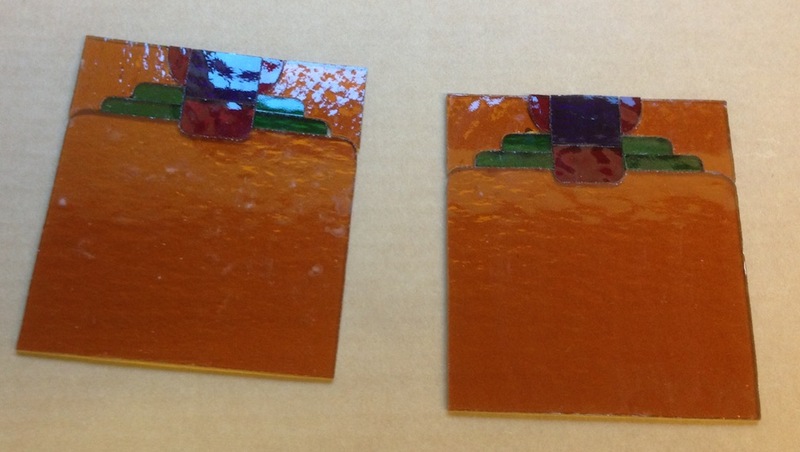 I tried gluing the pattern to the glass, but with only mixed results. I used a glue stick, and the pattern didn’t stay in place very well. Maybe a different glue, or maybe if I let it dry for 20 or 30 minutes, but that’s pretty inefficient in practice. A light table is the usual way people do this I think, but I don’t have one. Oh, wait… I used to have a light box for when I took pictures for articles I wrote for hot rod mags. After a pit of searching, I found it buried in a closet. And there was happiness and dancing in the streets. The light box really helped. 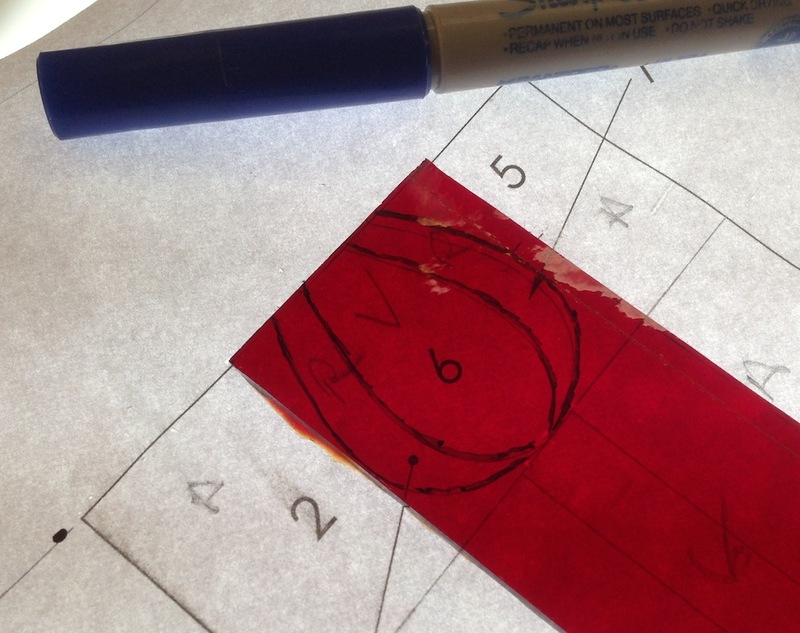 I find tracing the pattern onto the glass with a fine point sharpie helps me score the glass. 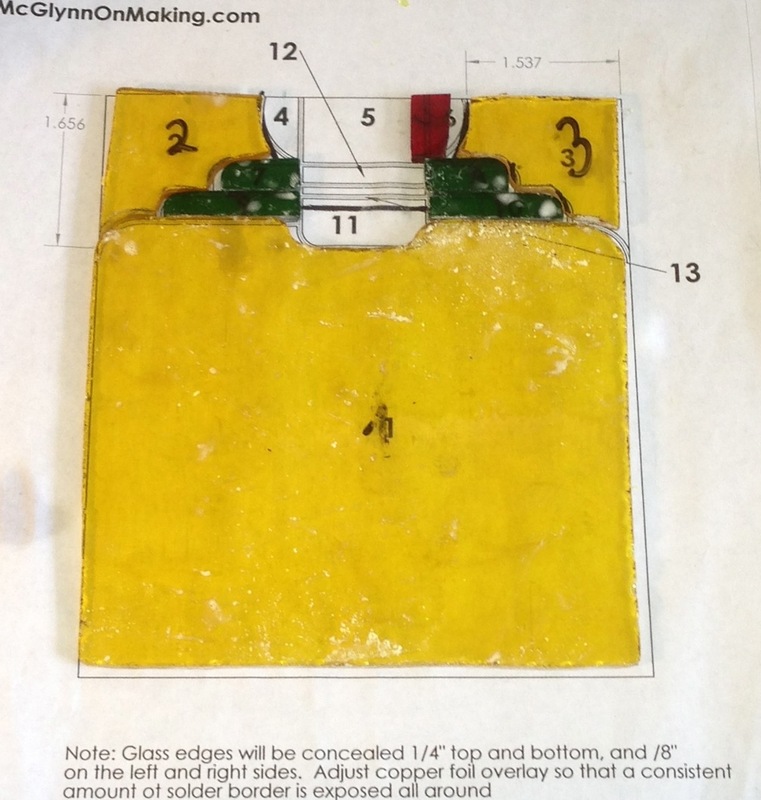 I found some instructional pages on scoring glass, but mostly it comes down to practice for me. I tend to push too hard, which kills any control (or finesse). All the parts for the sconces cut, ground and cleaned. Ready for foil. 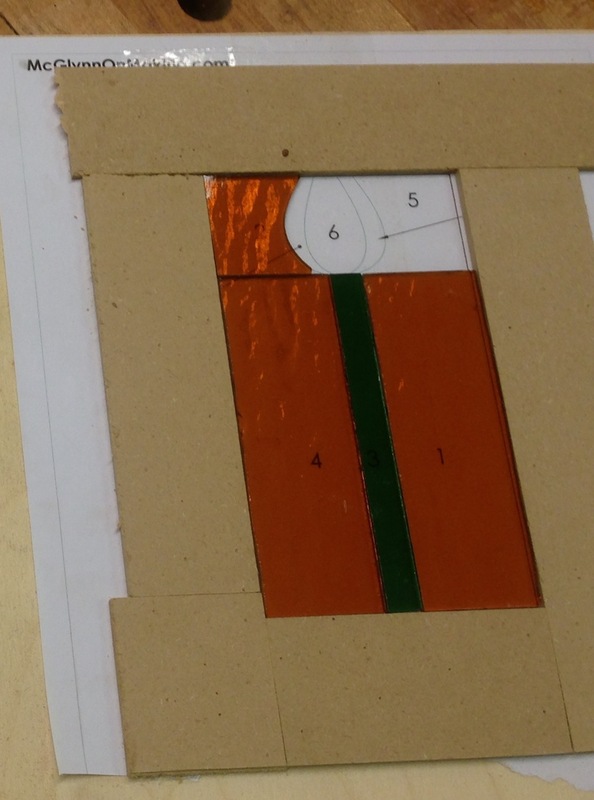 Once all of the parts were cut and ground so they fit nicely it was time to put copper foil on the edges. 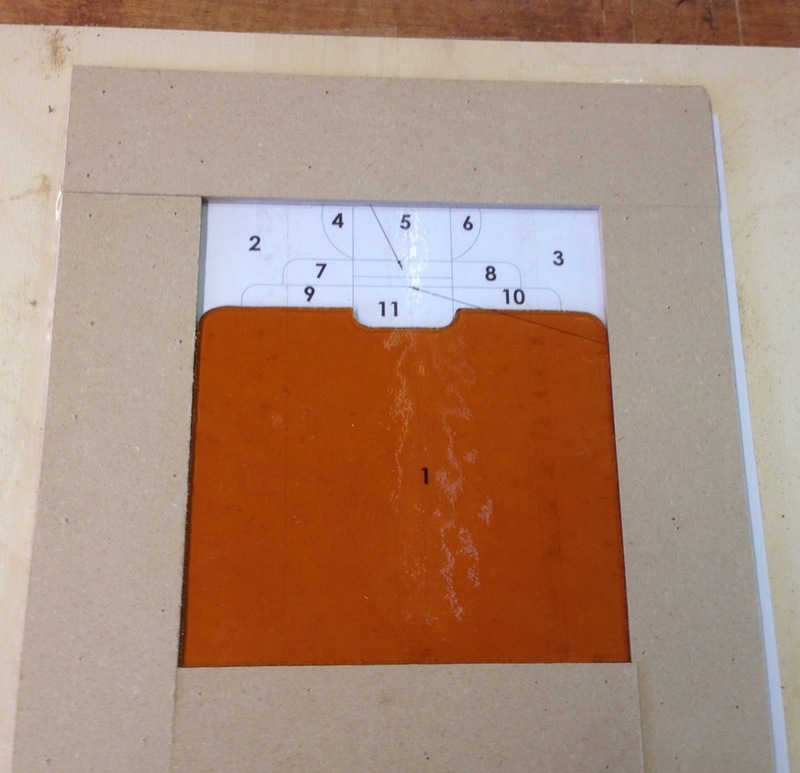 The copper foil is thin copper strips, 3/16″ wide in this case, that is adhesive-backed. You apply it to the edge and fold it over both faces. Big pieces are pretty easy to do, small and irregular pieces were a little tricky, but after doing several of them it was starting to go a little more smoothly. In my (extremely limited and nearly nonexistent) experience, the fit between the parts and the evenness of the foil that overlaps onto the surface are with dictates how tidy and even the solder seams will be..
After I soldered all the parts I cleaned them with flux remover, and soap and water. The next step in the process is to apply a black patina to the solder, then wax the parts. And that’s as far as I got today. Tomorrow morning I’ll solder the other three panels, and then start assembling the sconces. All parts for one sconce soldered and ready to apply black patina. Patina and wax applied, ready to install. 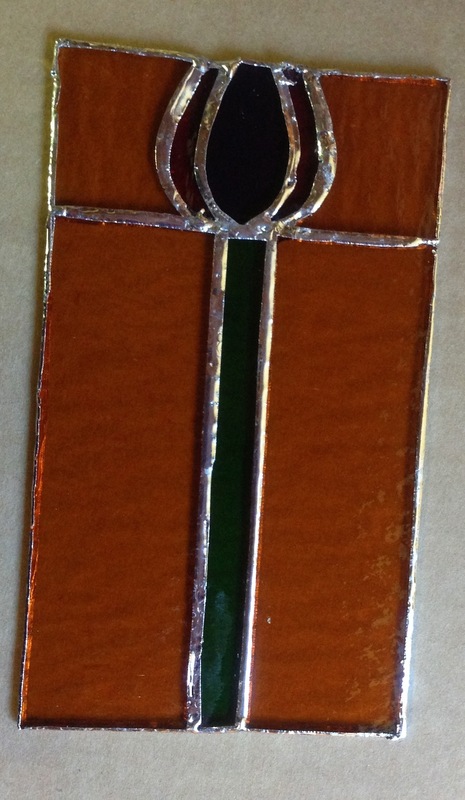 I got a couple more hours of work in on the stained glass panels for my sconces yesterday, with only 3 or 4 interruptions from work. I’m pleased with how these are coming together, and I’m learning as I go. When I took the 1 day class with my son I had two issues with my work. My skill with scoring the glass is not great. I mean, how could it be? I’ve never done this before. 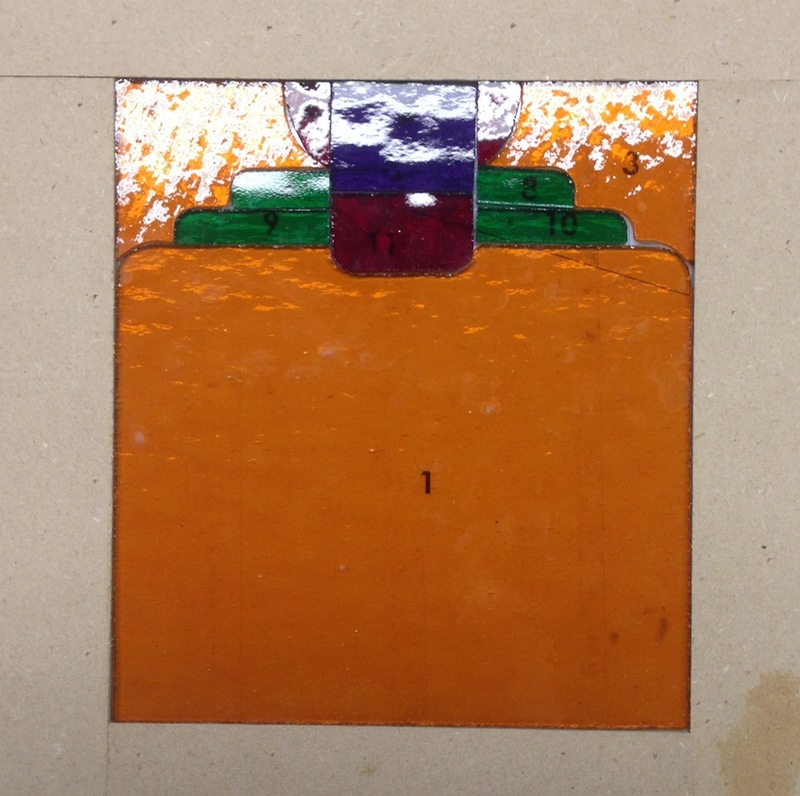 It’s gotten better, but I’m still not to the point where I can accurately follow a line with the glass cutter. The other problem was my pattern. 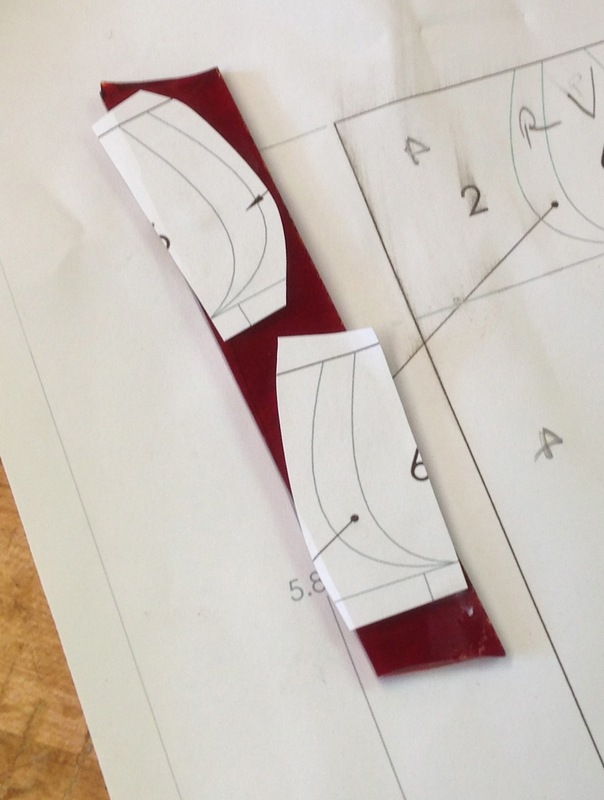 As I ground my cut out pieces and tested them against the pattern I found that my pattern lines were too wide and getting the piece in the same location every time was a challenge. If the part is slightly shifted (or all the parts around it shift) then it’s impossible to tell if the fit is right. 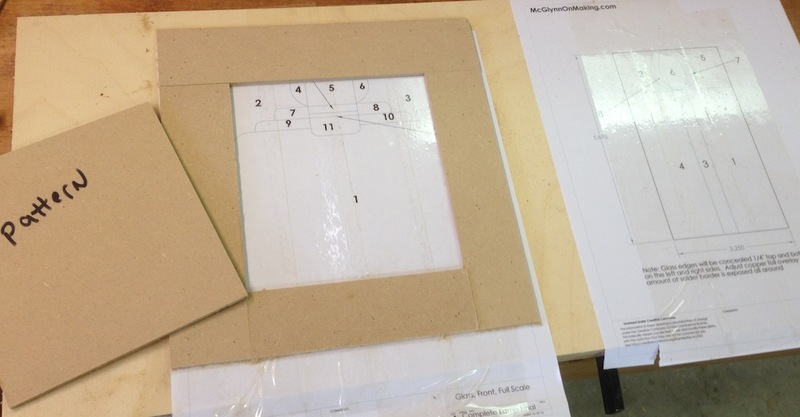 So I glued my patterns to a scrap of plywood and covered them with clear packing tape to protect them from water (the glass grinder uses a wet sponge to lubricate the little diamond grinding wheel). Then I positioned the MDF mockup of the panel I made for test fitting in the sconce over the pattern, and framed it in with some scraps of MDF. Now I have an accurate frame to help position the parts. This made a huge difference for me and I was able to get a nice tight fit. Maybe too tight, we’ll see when I add the copper foil to the parts and solder them later today. The grinding isn’t too bad, it’s not as fast as grinding wood (or metal), and maintaining a straight edge with a small round grinding wheel is a little tricky – but I’ve ground loads of stuff and have a decent eye for this. The trick is to check the part to the pattern, identify where material needs to be removed, grind a little and check again. 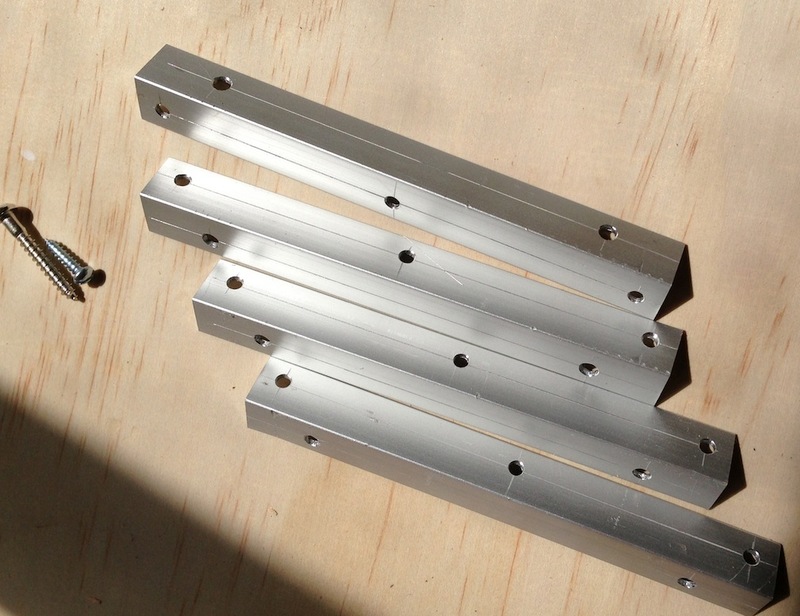 I over-ground on two or three pieces and decide to cut new parts. They were little, tiny bits, so the mistake was more obvious and not much material was wasted. Here is the first main panel all ground and together. 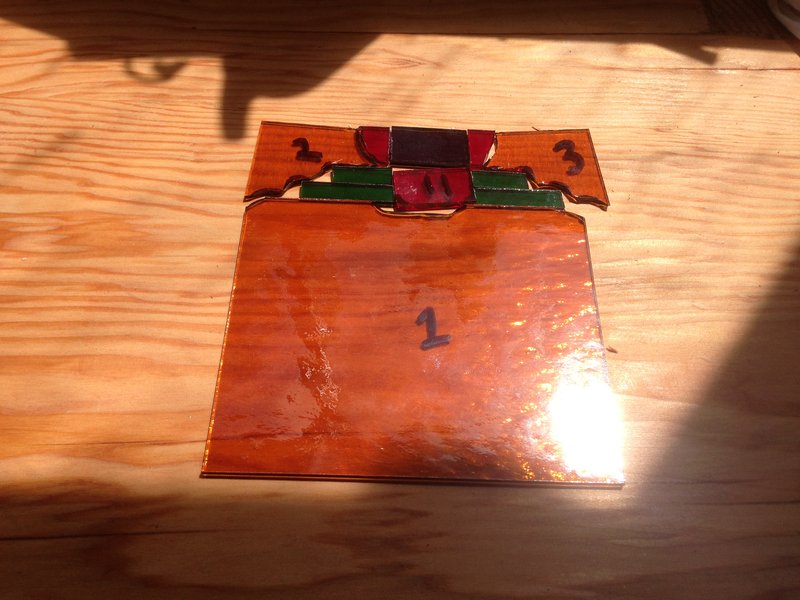 The next step will be to apply copper foil tape to the edges of the pieces and solder them together. 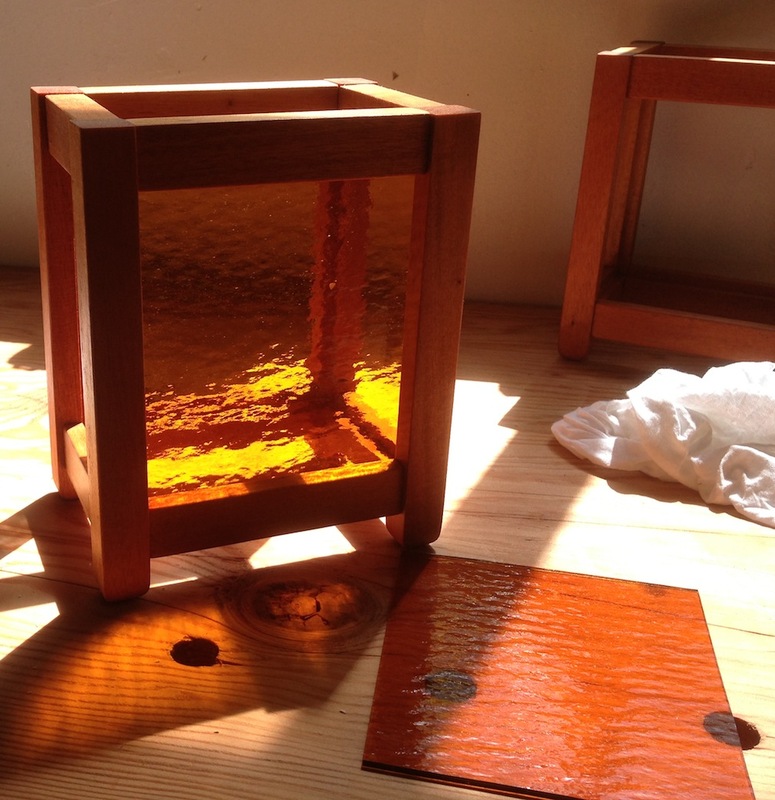 I’m going to get all of the glass for all six panels cut and ground before starting on assembly. By the way, this is the back of the glass. Since the front is moderately textured I have to score it from the back, and since the design is symmetrical I’m also grinding and assembling these face-down. Less chance of making a mistake this way. I don’t have any planned emergencies at work today, so hopefully I’ll be able to enjoy an uninterrupted day of vacation. At least until my wife and son get home from their Tahoe trip, then I expect all hell will break loose. 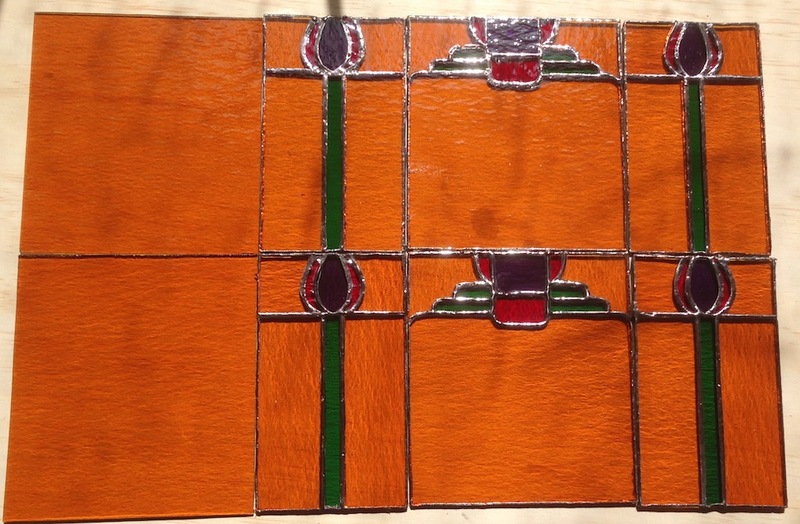 Between several new work crisis this morning I started on the stained glass panels for the Mahogany sconces I made, inspired by a sconce I’ve seen from the Blacker House. Let me put a giant caveat here: I’m just this side of clueless in terms of doing anything with glass. Anything beyond spritzing it with Windex and wiping it off is new ground for me. I took a one day class on stained glass recently, and splurged and bought a glass cutter, running pliers and a little glass grinder. Trusting in my ability to proceed without having a clue, I’m on my way. I started by cutting some patterns (templates? mockups?) 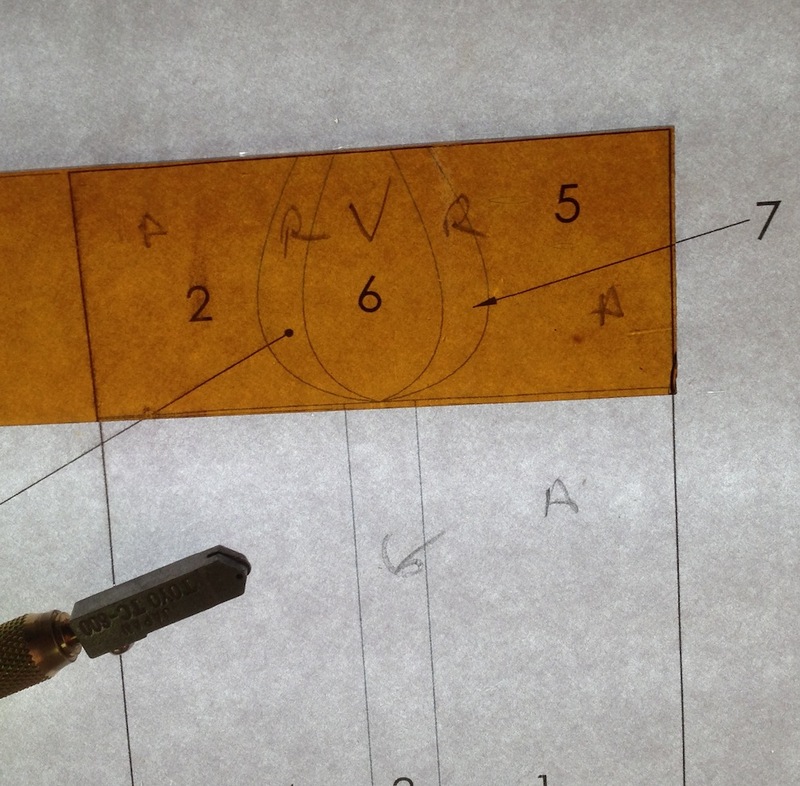 from 1/8″ MDF to make sure I had the sizes just right Because of some small variations in my woodworking the CAD patterns for the glass I drew up were slightly too tall, and one of them was slightly too narrow. 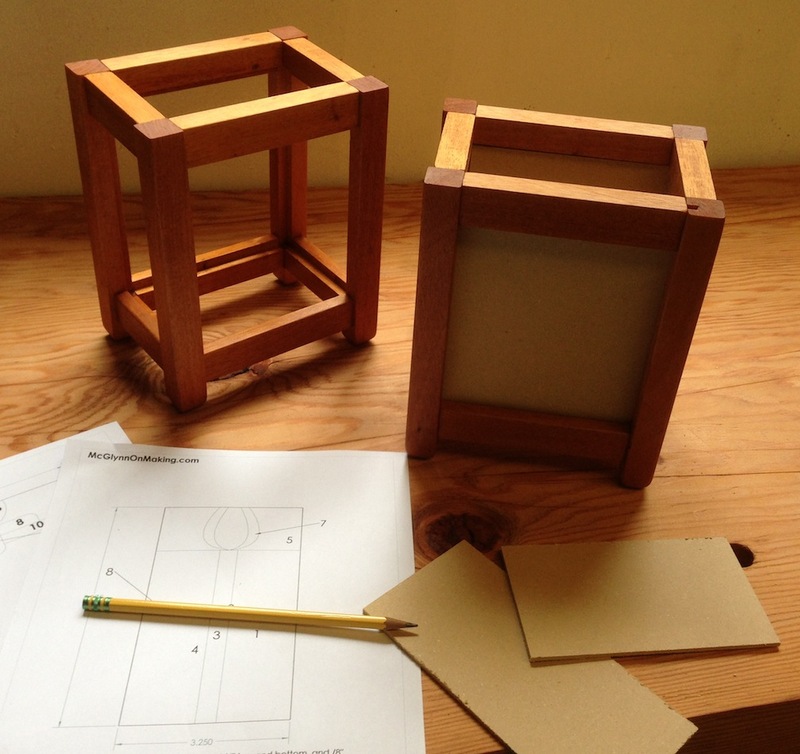 I adjusted the fit of the MDF mockups until they fit both sconce bodies without any problems. Then I did the next easiest thing I could do, which was to cut a blank glass panel for the back of the sconces — I’m not going to make a stained glass panel for the back as it won’t show. I’m just using a piece of the same glass as the main part of my pattern for the sides. Now the hard part, cutting all of the little bits of glass according to my pattern. The cuts I made on the practice piece at the class were sloppy, so I ended up with several big gaps, which meant big, wide solder joints. It wasn’t horrible, but it wasn’t really nice either. I feel like my cuts are better already, although this glass is darker than what I’d used previously so it’s hard to see the lines through the glass. 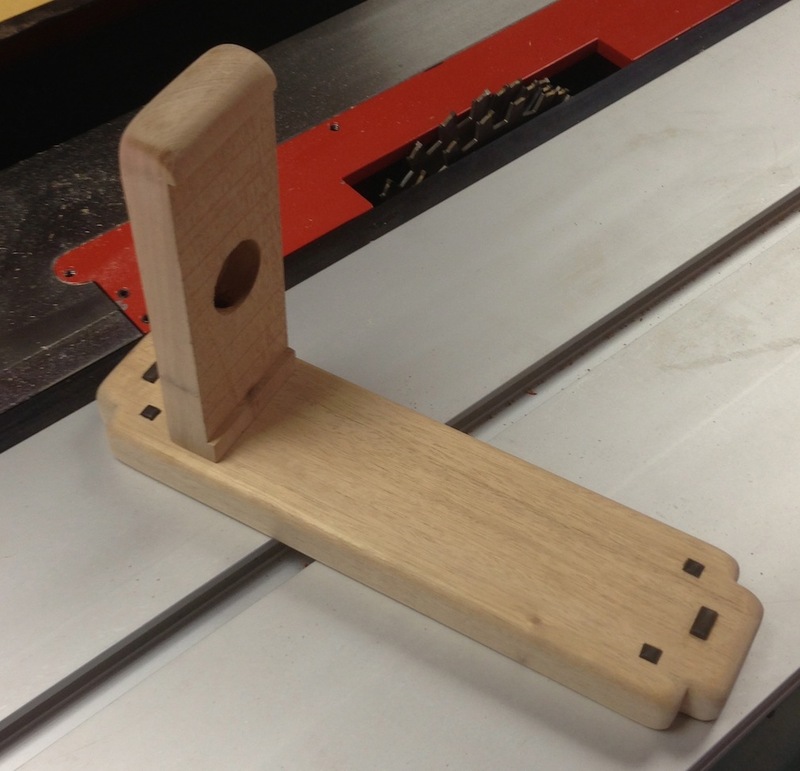 I cut the big section at the bottom first, the little indent cut came out pretty well. Not perfect, but the next stop will be the grinder. This top background pieces are really tricky, I did my best with them, and then marked them where they will need to be ground. For the tiny little pieces in the middle I cut them close and will have to grind them to fit. And that is my next task. 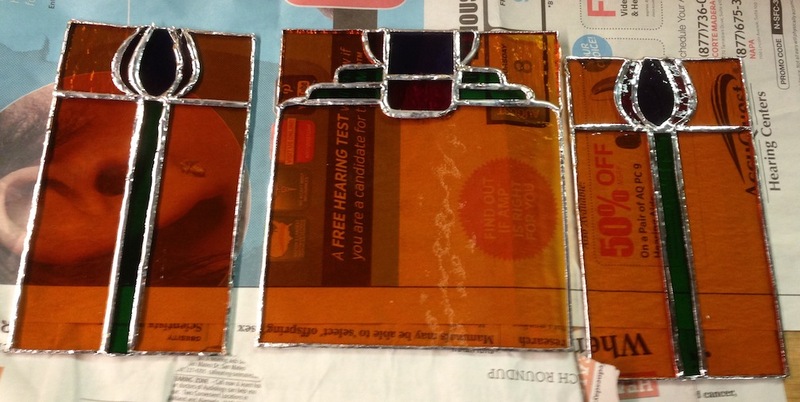 My son Kolya and I went to a introductory stained glass class today. We both had a good time and came home with finished projects. 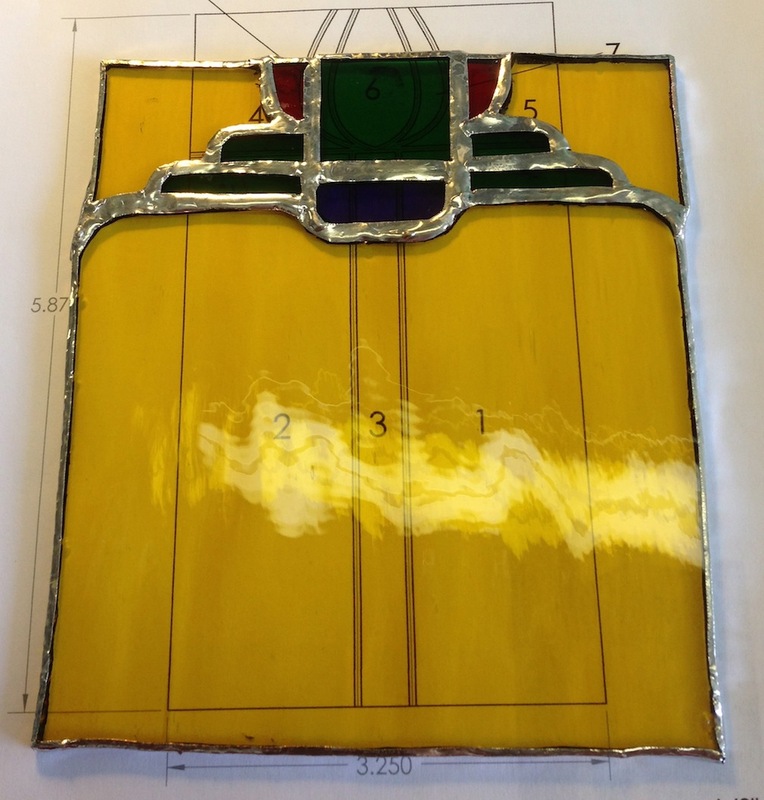 My goal was to see if I could make a panel for my Greene & Greene style sconces. 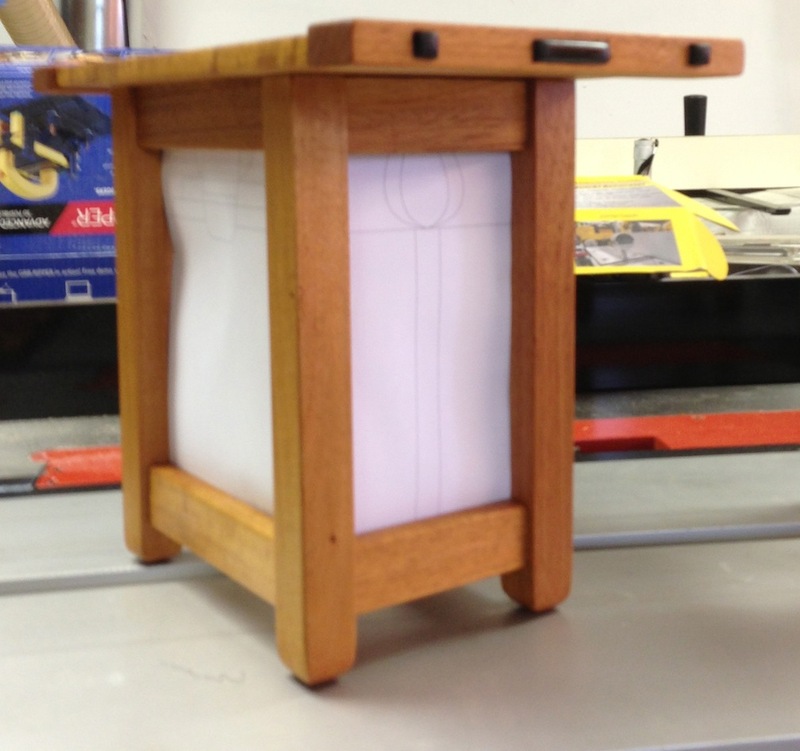 I had patterns ready and the instructor OK’d my project. The process is fairly straightforward, but of course the devil is in the details. My glass cutting needs some work, and there are a dozen little details that I wish I’d done better on, but I understand the process now and am confident I can do it. The gist of the process is to score the glass – and there is a special procedure for dealing with inside and outside curves. Snap the glass on the score lines and check it against the pattern. 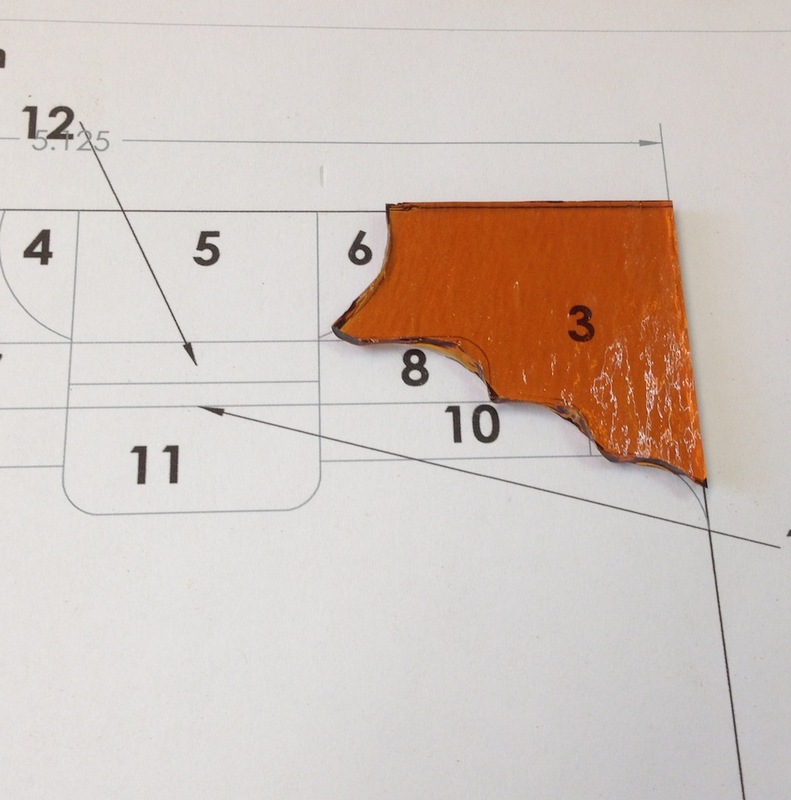 Any uneven edges get mark for grinding later after all the parts are cut out. This is a fairly complicated part only because the parts are small, and there are small inside curves. I cut them as best I could and then tried to fine turn them with the grinder. Once the parts are fine tuned they get cleaned to remove the grinding dust, then warmed on a hot plate to help the copper foil stick. The foil is rolled onto the edges so that it overlaps both faces just a little. On the finished piece my solder lines are a little wider than I’d like – which is a combination of too much of a gap between parts and perhaps too-wide copper foil tape. 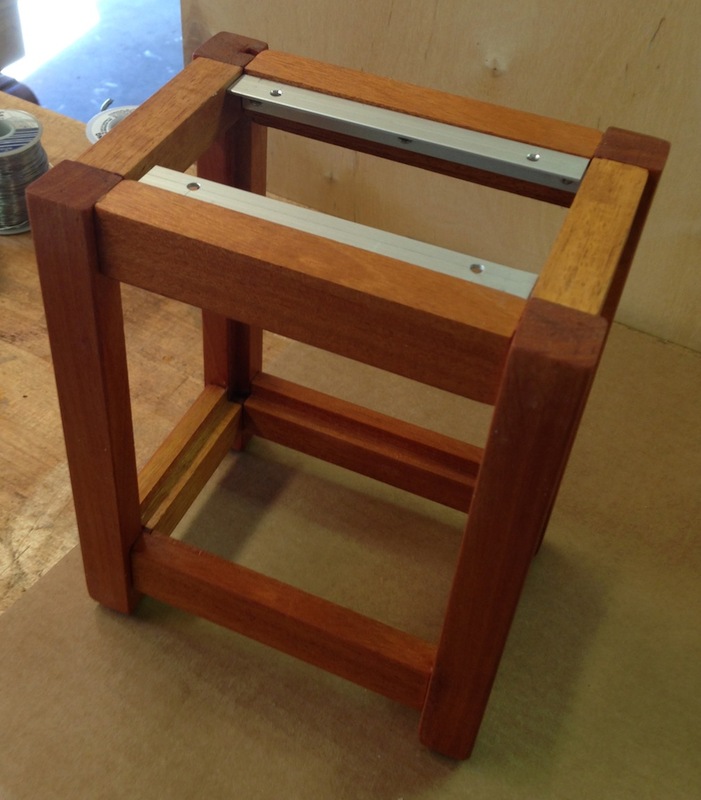 The parts are soldered from both sides, cleaned, a patina applied and a coat of wax applied. I give this one a C+ for effort. 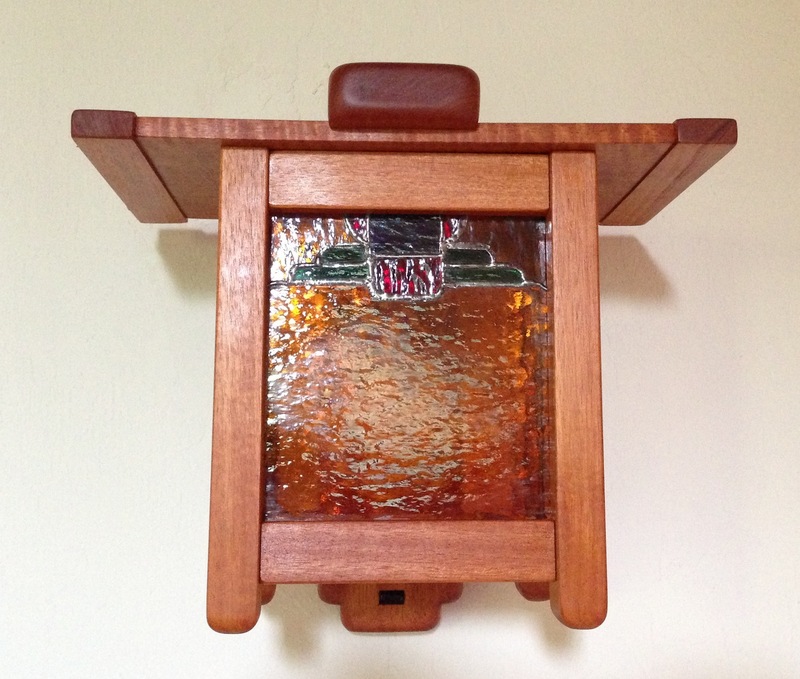 I’m going to buy my own set of glass tools and order some glass and make the parts for the sconces now. I updated my plans for the sconce I’ve been building, a sort-of reproduction of a sconce from the Blacker House, designed by Greene & Greene. Visually it’s pretty close I think. 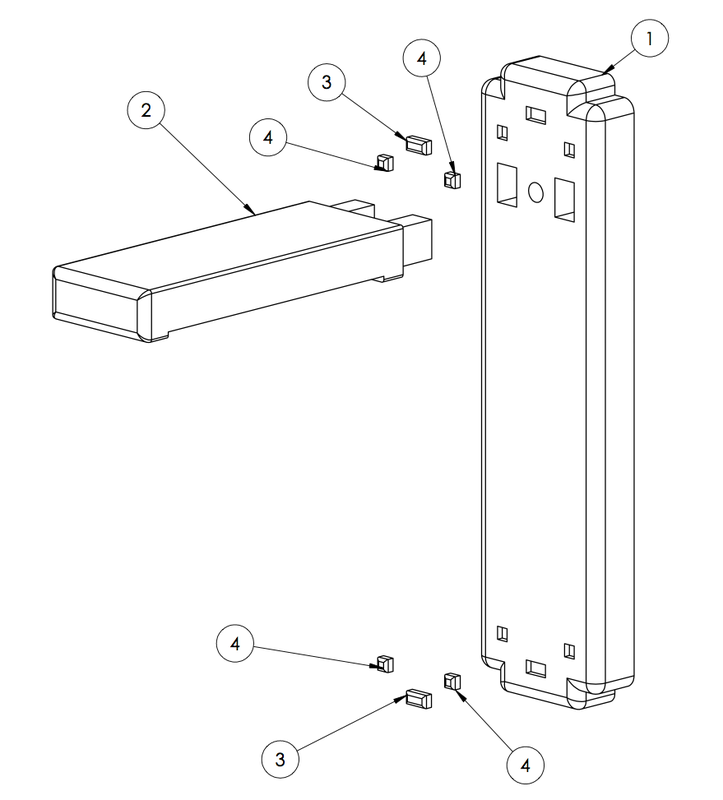 In this update I added some missing dimensions, and lengthened the wall bracket by 1/2″. I also created patterns for the stained glass and sent them to the woman that is going to be teaching the class I’m taking in a couple of weeks. Between now and then I’ll add a few more coats of oil to the sconce parts and start on another project. Let me know if you build something from these plans, this has been a fun project and I’ve learned a lot along the way. I’ll post pictures once I’ve done the glass and mounted them in the house. 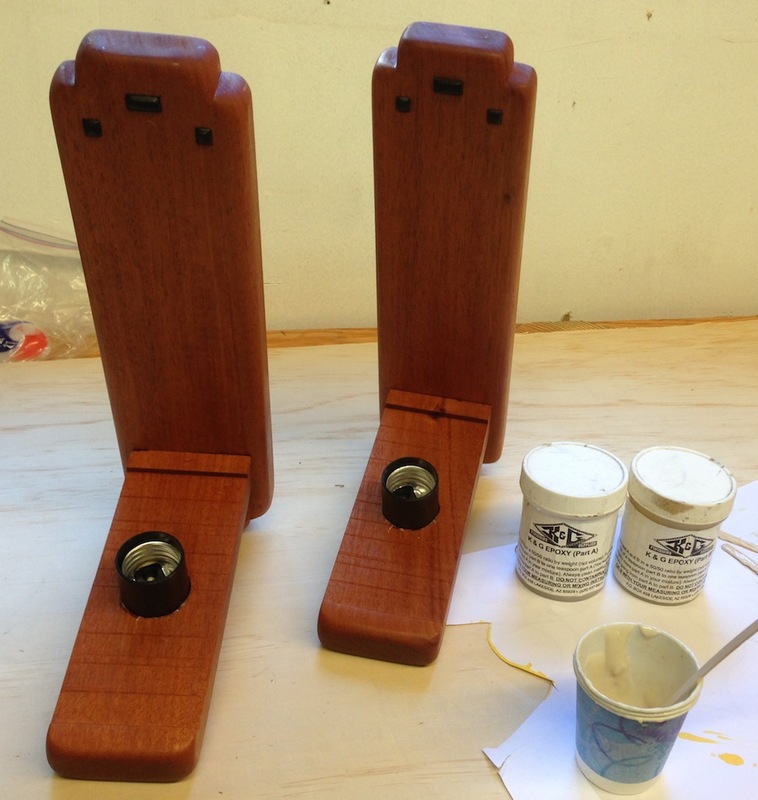 I just slathered on the first coat of finish on my sconces. 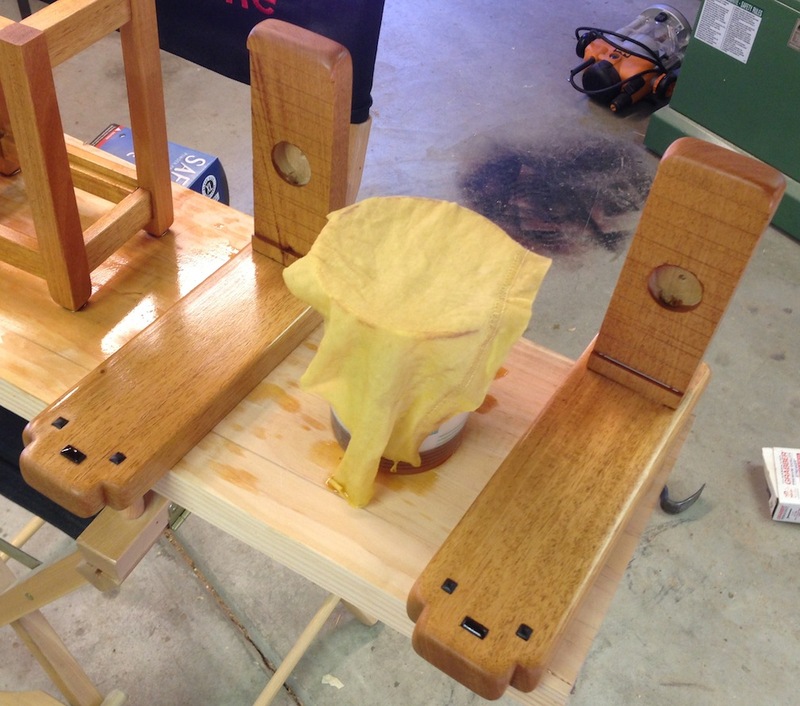 Just plain old boiled linseed oil. Nothing fancy. I decided that I’m going to put a coat or two of oil on and see how I like it. If it’s too light I’ll probably put a coat or two of Garnet shellac on to build up some color, but the thought of getting an even coat on these little parts with all the little edges and corners leaves me a tad put off. After one coat of oil the body and lid have reasonable color. The wall brackets — the last parts I made — are a bit too light. They will darken over time, so maybe I’ll just build up an all-oil finish and call it done. In the pics I haven’t wiped off the excess oil yet, so they show more sheen than they actually have at this point. So, what’s next? building up more finish, cleaning up the shop and deciding what to do for the glass panels. 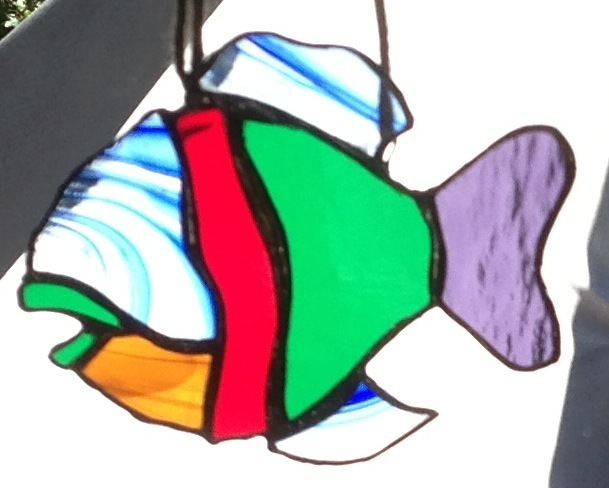 The local glass shop has a 1 day introductory stained glass class in a few weeks. That might be the best plan for getting a handle on the glasswork. 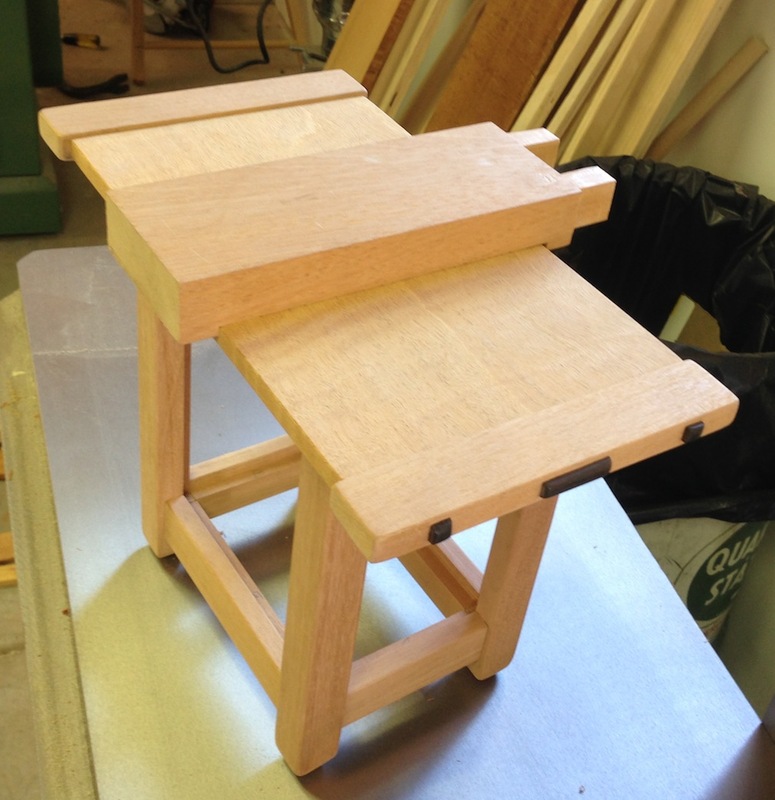 In the meantime I need to finish a few details on my tool cabinet and finish my Roubo workbench. 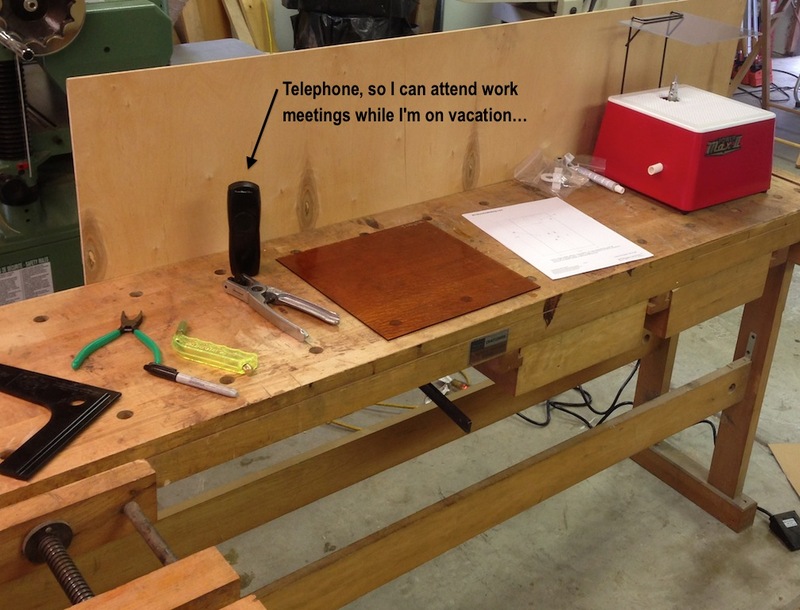 And I want to do 10 other projects, including a small wall-hung cabinet. Too many ideas, not enough time. Tops – These look really nice to me! Wall Brackets, too light still. Woodwork for Blacker Sconce Done! I finished up all of the wood fabrication and detailing for the first of the sconces yesterday. 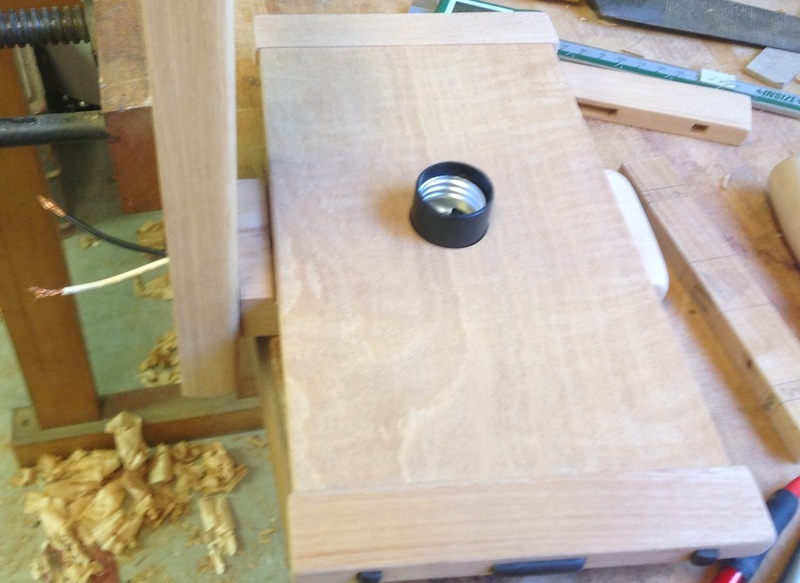 The second sconce isn’t far behind, I just need to sand it and fit the Ebony pegs. 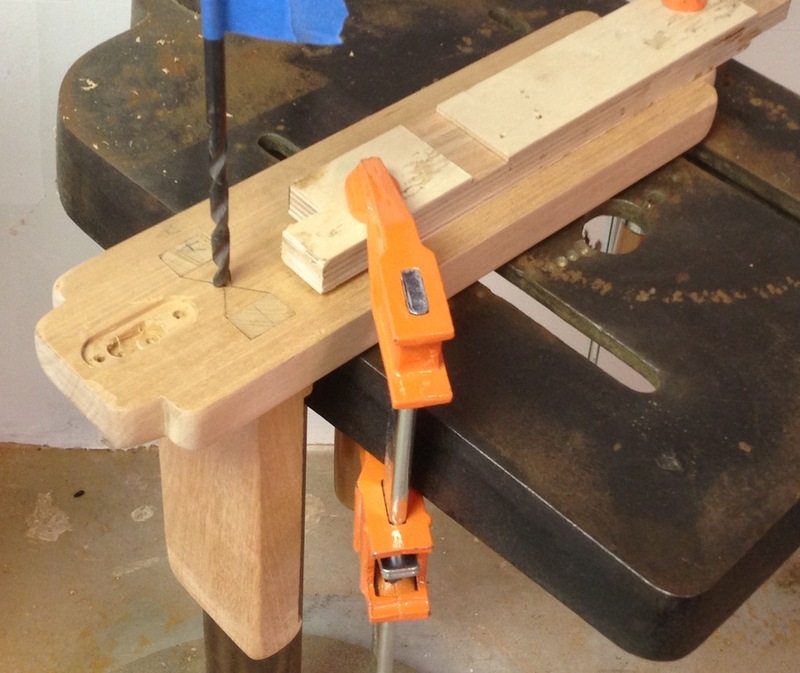 I started with a trip to the hardware store and found the “keyhole hangers” I needed and a router bit to cut the recess. This was pretty easy stuff. There is some weird trick of light that makes it look like they stick up above the surface in the picture below, but they don’t. Then I laid out the locations for the ebony details and chiseled out the waste. This wasn’t too bad, although it’s not as even as I’d like. I want to buy a set of those square punches from Lee Valley before I have to do more stuff like this. Like when I re-do my kitchen someday. 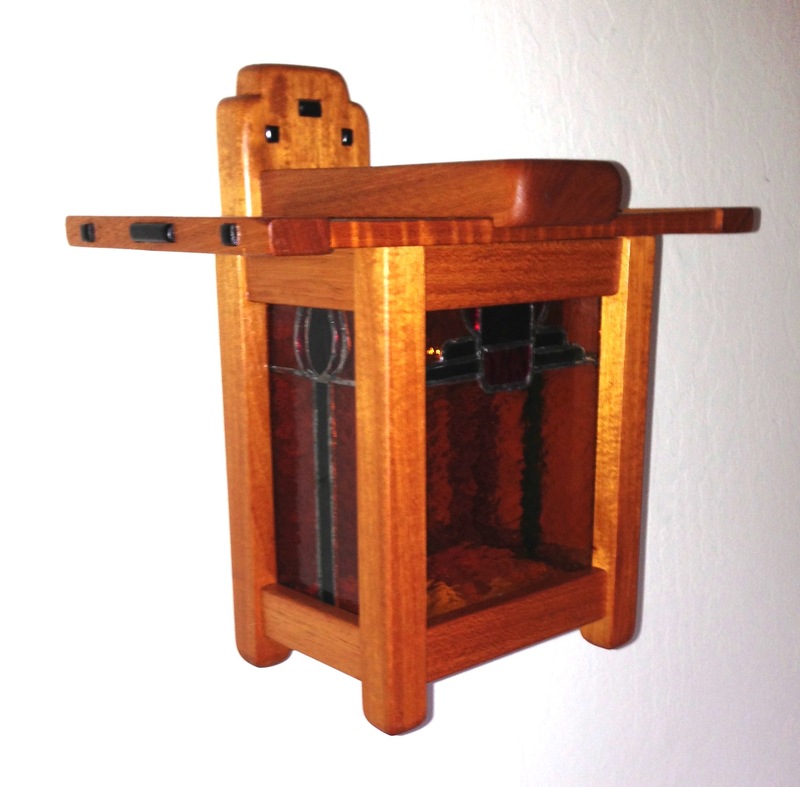 There are 12 ebony plugs in these sconces (there should be more, the originals had tiny 1/8″ plugs in the lantern body. Maybe I’ll go back and add those…) I just chopped them like shallow mortises, but all the edges show so any little inaccuracy shows up. There are s bunch of little detailed steps here, routing a groove in the back for the sires, cutting the “dog ear” notches, rounding over the edges, gluing up and fitting the pegs. I used a rasp and 100 grit paper to shape the ends after running around the outside of the part with a 1/4″ round over bit. I was trying to give it a slightly worn, slightly organic look as I’ve seen on some of the original Greene & Greene stuff. I need to finish up the last bits of fabrication on the bracket for the second sconce, then I can start laying on finish. Wow! Now I need to figure out how to do the stained glass. I’ll update my plans for this sconce based on what I’ve found while making these — I missed putting in a few dimensions and I think the wall bracket should be a tad longer, maybe as much as 1″, so it hange a little more below the lantern body. 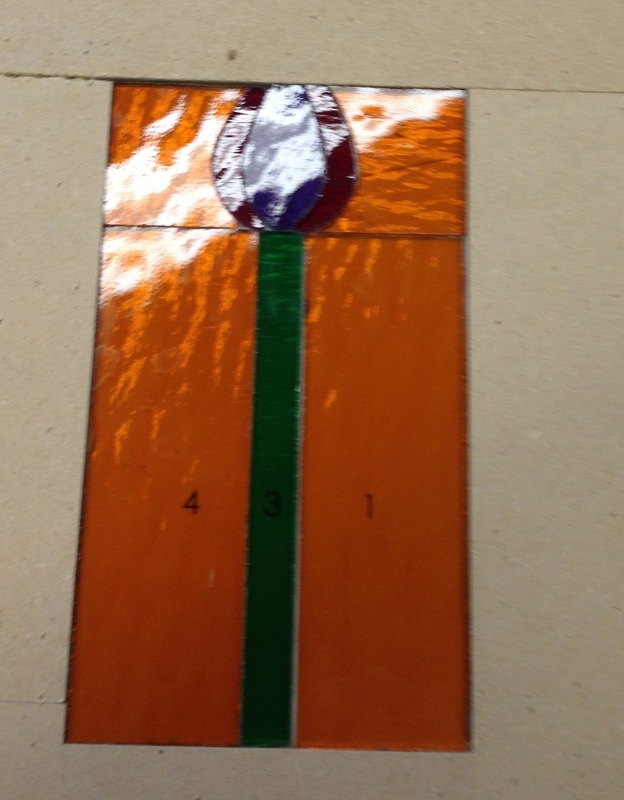 And I need to add in patterns for the stained glass. 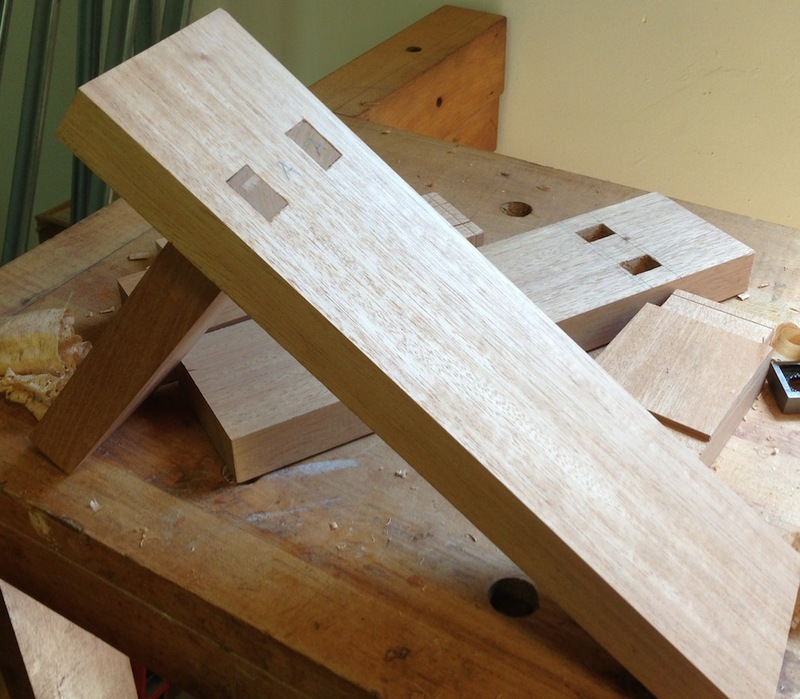 I processed some more Mahogany stock to make the wall brackets for the pair of Greene & Greene sconces I’m working on. 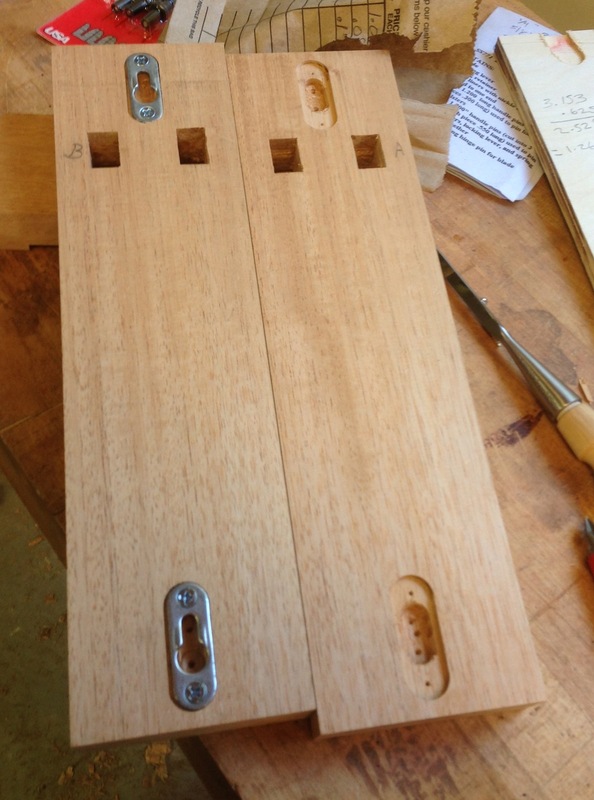 I have no idea how the originals were constructed, but this is what I came up with — twin tenons. The hole in between is for the wiring. 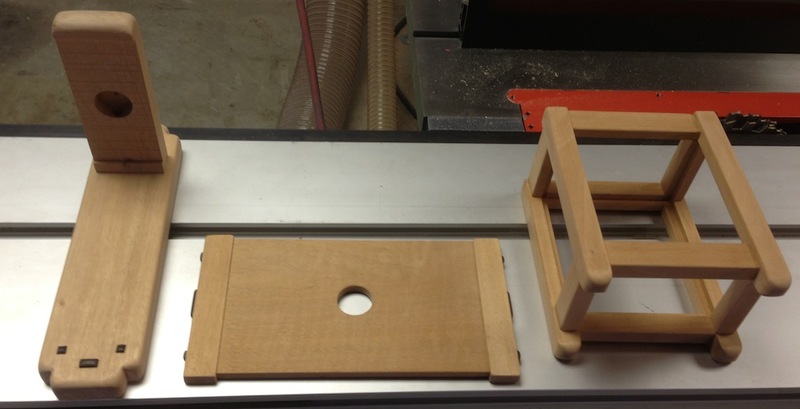 I chopped the mortises first, so I’d have something to gauge the tenon size from. 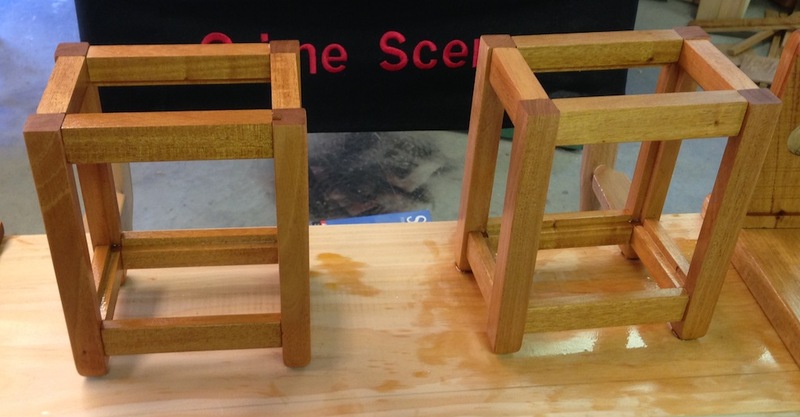 I was really pleased with how well this process went, I chopped the mortises using a regular bevel edge chisel the way I’ve seen Paul Sellers do it in his videos. 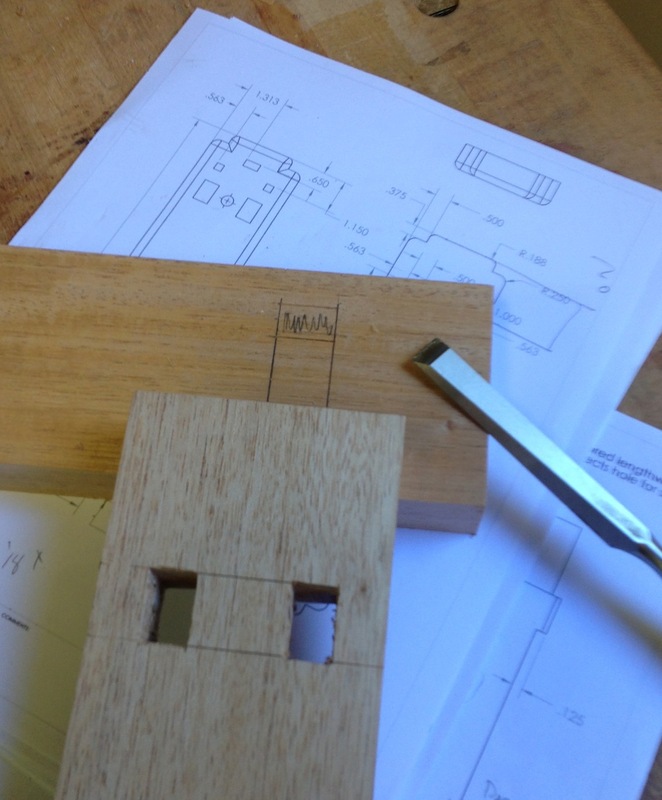 I laid out the location in pencil then scribed the exact location with a mortise gauge and knifed in the top and bottoms. Then I transferred the location to the backside using knife nicks at the corners and did the same layout on the back. 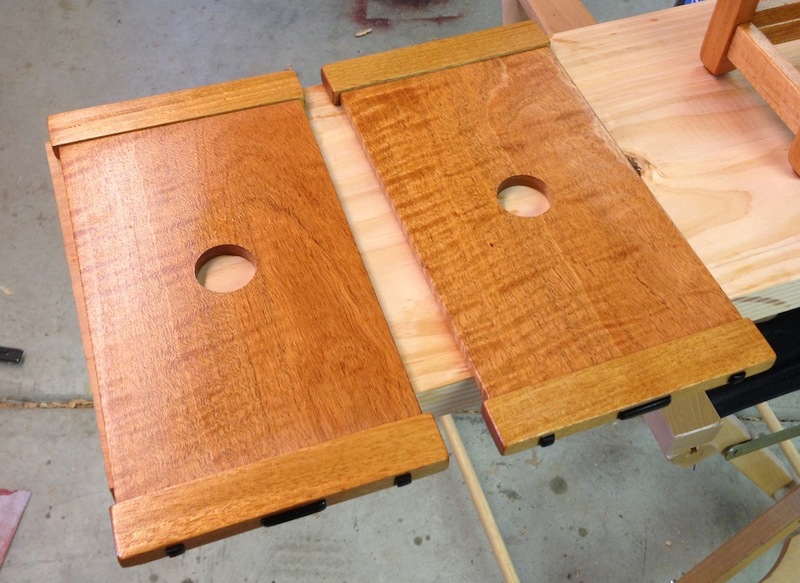 I chopped half way through from each side and ended up with nice, true mortises. 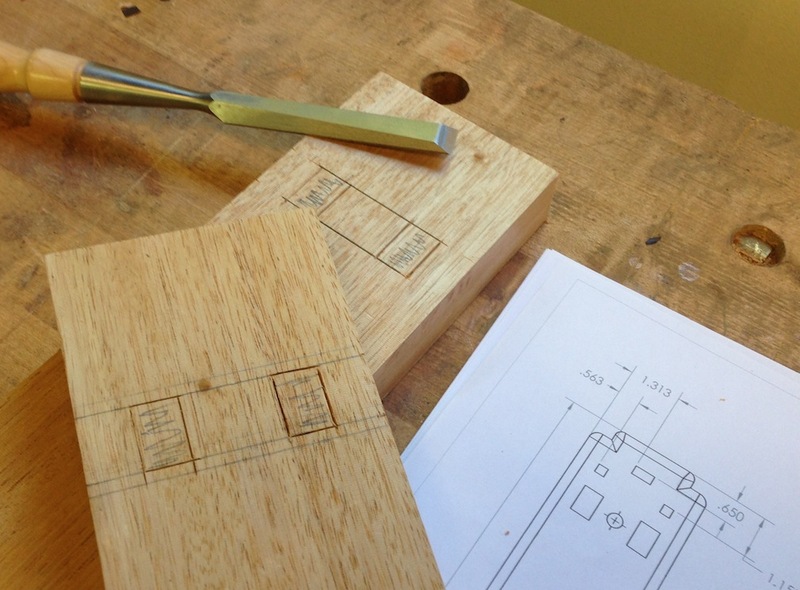 I;m really enjoying using my Lie-Nielsen chisels, they hold an edge much better than my old chisels. And this Mahogany chisels nicely. 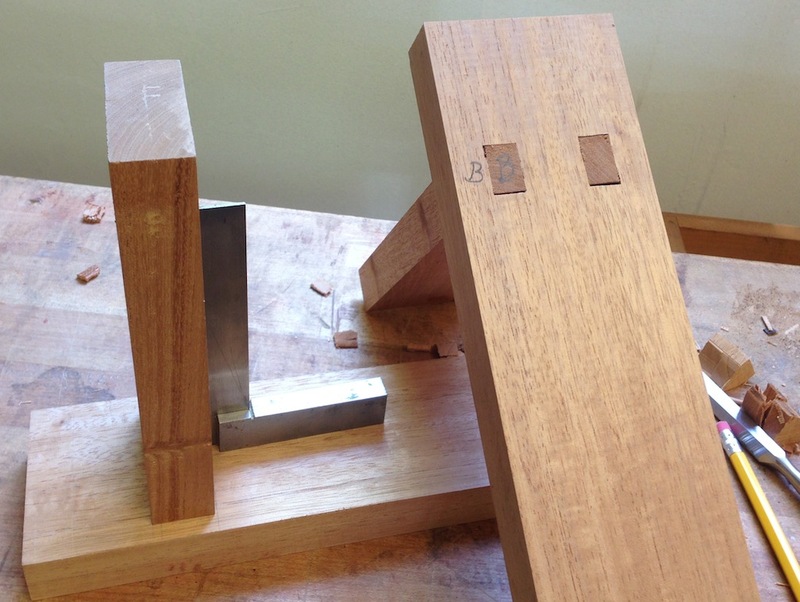 Once I had the mortises chopped I cut the shoulders for the tenons with a dado blade, then transferred the width of the tenons directly from the mortises to the tenon piece, and sawed them with a back saw. I stayed off of the line and pared to the line, checked the fit, pared a little more and viola! Lather, rinse, repeat and I have the second part fit up. 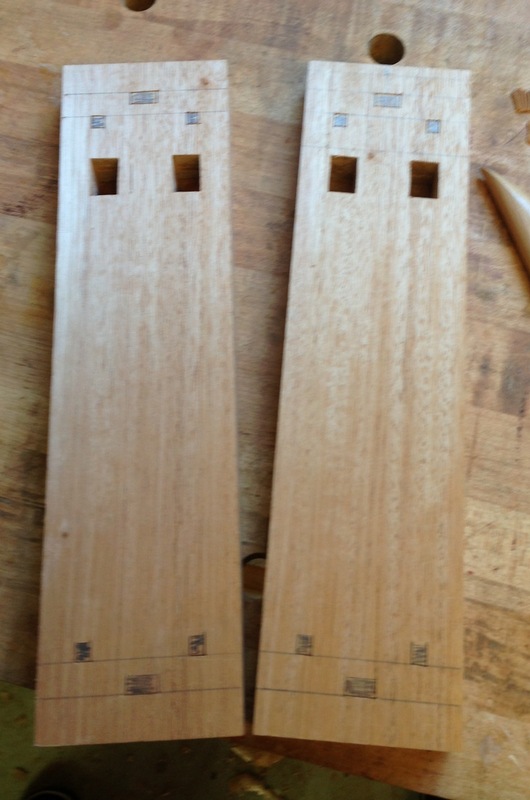 When I glue these up I’m going to wedge the tenons to make sure they won’t some loose or sag. 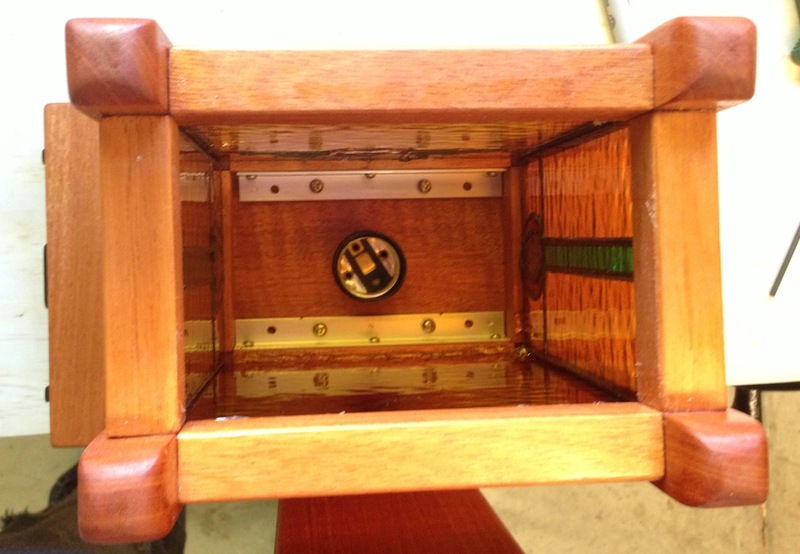 The lantern and wiring won’n weigh much even with the glass installed, but I want to make sure it’s nice and sturdy. There are a lot of little details to take care of still. I have to shape the back pieces, inset the Ebony accents, drill for wiring and figure out how to mount these on the wall. That last one I’m still not 100% clear on as I haven’t found the hardware I want to use. I want to inset some brackets in the back to be able to hook these over some protruding screws, and I’m thinking that mounting the hardware should probably be one of the very next steps. Rats! 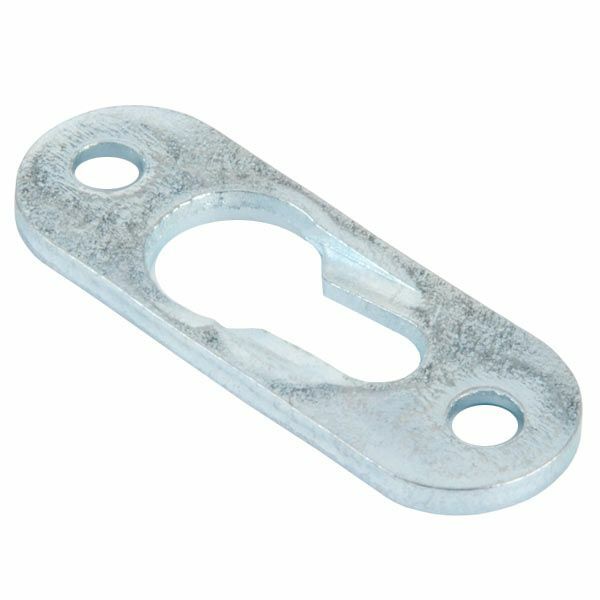 I just did some quick research, apparently these are called “keyhole hangers”, and Woodcraft carries a size that will probably work. Maybe the local hardware store has something similar. I like the ramped slot in this which will tend to draw the lamp tighter to the wall as it slides on. Time to go shopping!